Should dogs be allowed in the splash park? 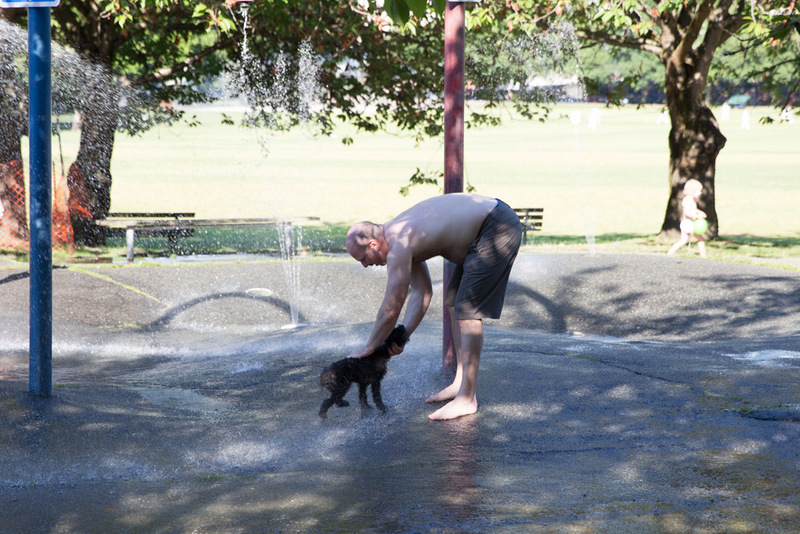 I’d love to know what the consensus is out there–should dogs be allowed in the splash park? We took the kids to the splash park tonight to play and have a picnic. While we were there, this guy named Jack came with his dog, and started washing his dog with the spray. Actually, I don’t know his name. I just generally use “Jack” for a jackass. With a sign at the park that says no dogs allowed in the spray park, it didn’t deter him. That’s ok. Maybe he didn’t see the sign. Cliff went over to remind him dogs are not allowed in the spray park. He had a staring contest with Cliff, and took off. What I didn’t expect was that he came back 5 minutes later, washing his dog again. This time he got into a verbal fight with Cliff, swearing and yelling in front of 8 kids in the park. Cliff reminded him this is a family area and community, and he swore some more. Jack was classy. Eventually Jack finished washing his dog and walked away, leaving me with a grumpy husband for the rest of the night. I don’t know what the purpose of the no dog rule is at a splash park, but I would guess it has something to do with sanitary reasons. It seems wrong to me to wash your dog in the same water that little kids play in. As a dog owner for about a decade, I love dogs but I also wouldn’t let me dog in the splash park or playground. So, I want to hear your thoughts. Is Jack a jackass, or did we over react to something minor? This entry was posted in Random and tagged Jack, spray park by angelasaito. Bookmark the permalink.